Carex caespitosa Gooden. Trans. Linn. Soc. 2: 195. pl. 21. 1794. Not L. 1753. 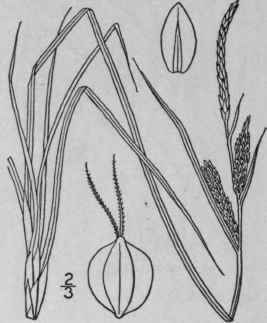 C. Goodenowii J. Gay, Ann. Sci. Nat. (II.) 11: 191. 1839. Carex vulgaris E. Fries, Mant. 3: 153. 1842. 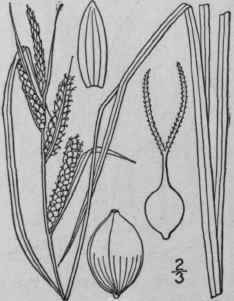 Carex vulgaris var. strictiformis Bailey, Mem. Torr. Glabrous, culms stiff, erect, sharp-angled, smooth or sometimes rough above, 1°-3° tall, phyllopodic, strongly stoloniferous. Leaves elongated, glaucous, 1"-2" wide, not exceeding the culm, the margins involute in drying; lower bracts usually foliaceous, sometimes equalling the culm; staminate spike stalked; pistillate spikes 2-4, all sessile or nearly so, erect, densely many-flowered, narrowly cylindric, 2"-2 1/2" in diameter, 5"-20" long; perigynia flattened, broadly oval or ovate, finely nerved, green or dark-tinged, appressed, 1 1/2" long, minutely beaked, the orifice nearly entire; scales purple-brown to black with a slender green midvein, very obtuse (except lower), shorter than the perigynia; stigmas 2. In wet grounds, Newfoundland to Massachusetts; Pennsylvania. Europe and Asia. Tufted or Common sedge. Torrets or Turrets. Stare or Star. June-Aug.
Carex lenticularis Michx. Fl. Bor. Am. 2: 172. 1803. Glabrous, pale green, culms very slender, erect, sharp-angled, slightly rough above, 1°-2° tall, phyllopodic, densely caespitose, not stoloniferous. Leaves ejongated, rarely over 1" wide, shorter than or rarely overtopping the culm, slightly rough-margined, their sheaths not fibrillose; lower bracts similar to the leaves, more or less sheathing, usually much overtopping the spikes; staminate spikes solitary or rarely 2, sessile or short-stalked, often pistillate above; pistillate spikes 2-5, clustered at the summit or the lower distant, sessile or the lower short-stalked, erect, linear-cylindric, 4"-2' long, 1 1/2"-2" in diameter; perigynia ovate or elliptic, 1 1/4" long, 3/4" wide, acute, minutely granulate, faintly few-nerved, appressed, tipped with a minute entire beak; scales dark-tinged between the broad green center and the hyaline margins, usually obtuse and much shorter than the perigynia; stigmas 2. On shores, Labrador to Saskatchewan, south to Massachusetts, New York and Minnesota. Ascends to 4500 ft. in the White Mountains. June-Aug.
Carex aquatilis Wahl. Kongl. Vet. Acad. Handl. (II.) 24: 165. 1803. Glabrous, somewhat glaucous and pale green, culms phyllopodic, caespitose, long-stoloniferous, rather stout, erect, sharp-angled above, smooth or somewhat rough above, 2°-5° tall. 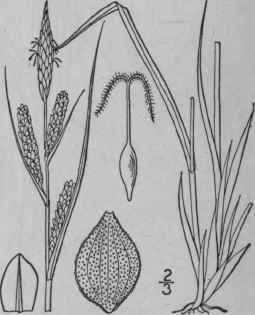 Leaves elongated, sometimes equalling the culm, 2"-4" wide, their sheaths nodulose; bracts broad, similar to the leaves, the lower usually much overtopping the culm; staminate spikes 2-3, stalked; pistillate spikes 3-5, narrowly linear-cylindric, often staminate at the summit, erect or slightly spreading, 1'-3 1/2 long, 2"-3" in diameter, many-flowered, sessile and dense, or the lower narrowed and loosely flowered at the base and short-stalked; perigynia elliptic or obovate, green, nerveless or faintly nerved, minutely beaked, the orifice entire; scales oblong, obtuse to acuminate, from much shorter than to exceeding the perigynia, but much narrower; stigmas 2. In swamps and along streams, Newfoundland to Alaska, south to Maryland and Texas and in the western mountains. Also in Europe and Asia. Widely variable. June-Aug.
Carex Emoryi Dewey (C. millegrana Holm), with sharply trigonous culms, very rough involute-margined leaves and strongly nerved perigynia occurs from New Jersey and Maryland to North Dakota and New Mexico.